The most celebrated and historic core of the city – including the Faubourg Marigny, French Quarter, Central Business District, Warehouse and Arts District, Magazine Street, Garden District, Audubon Park and Zoo and St. Charles Avenue – not only remains intact, both physically and spiritually, but is thriving. The cultural riches, sensual indulgences and unparalleled service that define the New Orleans experience continue to flourish, as they have for centuries. We are open, fully prepared and eager to welcome all of our visitors again. With all of its facets, a New Orleans experience is never anything but completely authentic. The city’s marvelous eccentricities are born from a rich heritage, respectfully and indelibly woven into the fabric of everyday life here. New Orleans doesn’t act a part for its visitors; it simply welcomes everyone with open arms to a world all its own. This is the best place to have a snack, a meal, or to try all that New Orleans has to offer. Sit at the bar and have some of the best oysters in New Orleans, or grab a table with friends and have a plate of red beans and rice, gumbo, or Creole jambalaya, and make sure you try one of the "Poopa's". They also have plenty of fresh seafood and the best "Po-Boy" sandwiches you've ever had. And Acme is a great place to just hang out and have a cold beer. I eat here on every visit to the "Big Easy". Never a mistake! Call Allyson before your visit and she will arrange anything from dinner for one, to a large party. Chef Paul Prudhomme's fantastic Cajun restaurant. The menu changes daily, sometimes hourly, as K-Paul's has no freezer, and the food is brought in fresh. Beautiful and comfortable dining rooms and exquisite service makes this one of the best places to dine in New Orleans. Make sure to call ahead for reservations, as K-Paul's is always busy. 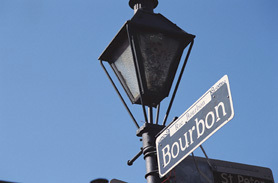 Savor serious steaks on a historic French Quarter balcony overlooking bustling Bourbon Street. Embers offers steaks and a selection of local specialties such as soft shell crabs, blackened catfish and a seafood platter. The oversized prime rib averages two pounds and is served with salad and a baked potato. Better bring a friend (or two or three). The Embers Steak House has long been the place to retreat to for New Orleans revelry and great Creole cuisine, seafood and steaks. Watch as the chef grilles your steak to perfection on the open grill, then watch the folks on world-famous Bourbon Street as you dine on the balcony. Coffee and Begneits (powdered donuts-yum! ), good place any time, but particulary good after a night of partying. This is THE place to have a Hurricane. Bloody Mary's are excellent, too. And don't forget to take your souvenir glass home. This is a great bar, aptly named, that is best saved for very late...or very early, if you know what I mean! "Everyone you have known or ever will know, eventually ends up at the Old Absinthe House ! " This little local is a "the best excuse" for staying out late! Even after all the other French Quarter bars are closed, the Alibi is still open, serving over 150 beers and great food. Always a sure bet for a late breakfast. Pool tables, video poker and a juke box, and possibly the best hamburger in New Orleans! Originally an Indian trading post, later a bustling open-air market under the French and Spanish, the French Market now contains shops, offices, and eating places. This complex of renovated buildings, which extends several blocks along Decatur and North Peters streets, has always figured strongly in the life of the city. You'll enjoy exploring them not only from the street but also from the flagstone areas alongside and behind the buildings. On weekends there are usually street performers and musicians enlivening the outdoor areas of the market. The heart of the French Quarter, Jackson Square was founded in 1718. Until the 1850s, the square was called the Place d'Armes and was a military marching ground. It was also the site of public executions carried out in various styles, including burning at the stake, beheading, breaking on the wheel, and hanging. Today the square is a beautifully landscaped park. A statue of Andrew Jackson, victorious leader of the Battle of New Orleans in the War of 1812, commands the center of the square. The words carved in the base on the cathedral side of the statue--"The Union must and shall be preserved"--are a lasting reminder of the federal troops who occupied New Orleans during the Civil War and who inscribed them. A large collection of artifacts and information on voodoo as it was--and still is--practiced in New Orleans is here at the only such museum in the world. The gift shop sells gris-gris potions and voodoo dolls. Readings, lectures, and voodoo tours and cemetery tours are available through the museum. Scary! This stretch of green from Canal Street to Esplanade Avenue has a breathtaking view of the mighty Mississippi as it curves around New Orleans, giving the city the name the Crescent City. The park has undergone a recent expansion and is now one of the most accessible riverfront areas in the country. .
>>Search Pollstar for live music in New Orleans!